It's shocking, but I actually cooked two new recipes in a row! Since I've been on a huge papercrafting kick, I haven't been experimenting with new recipes or cooking more than a couple times a week (and eating leftovers or salads for the balance of the week). While neither the recipe below, nor the one scheduled for tomorrow is terribly novel or exciting, both are comfy foods for crisp fall weather. 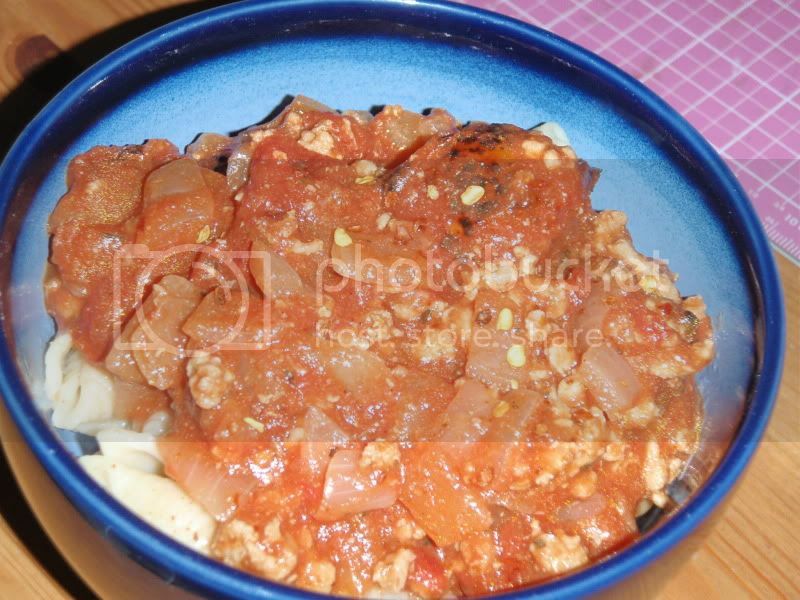 The secret to this hearty pasta sauce is the roasted tomatoes, which I purchased at Whole Foods. 1. Saute onions in a medium sauce pan until tender. 2. Add ground turkey, sprinkled with salt, pepper, and minced garlic. Use a spatula to break up meat. Cook until browned and liquid is mostly evaporated, about 10 minutes. 3. Chop whole tomatoes, reserving juices. Add tomatoes, juices, tomato paste, and crushed red pepper to meat. 4. Simmer for 15-20 minutes to all tomatoes to break down. 5. Adjust seasonings to taste. Serve over your choice of pasta with a sprinkle of parmesan or parsley.